Have you ever been out and about and suddenly had a “Panic Attack” because your go-to device (Smart Phone, Tablet) was running out of battery? So what do you do if you run into a situation where you will be out for long periods, and you aren’t sure if your device will make it? The easiest solution is to carry a battery power bank. In essence, the power bank is a portable charger for your device. There are many power bank choices, however Groupon has one of the better deals going on, that ends today (July 1). 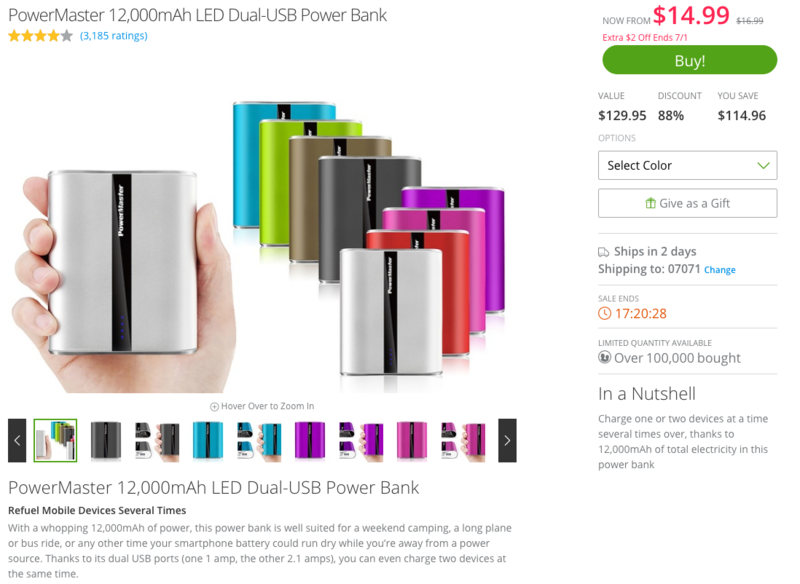 From Groupon – The PowerMaster 12,000mAh LED Dual-USB Power Bank, which normally retails for $129.95 is on sale for only $14.99. The average device these days uses a battery that is between 2,000mAh and 3,000 mAh, so this battery power bank, will be able to charger your device multiple times or charge multiple device before it needs to be recharged. Note the sale does end today so if you want it, you need to get it quickly.